During the Second World War, the German Reichskulturkammer considered circus performances to be important instruments of entertainment, both for German soldiers on the front and for the general civilian population, which was increasingly affected by the war. In particular, since the mid-1930s, the Reichskulturkammer has recognized that circus performances held a huge propaganda potential for the dissemination of National Socialist worldviews. This was particularly the case in the spreading of the idea that Germans were members of a master race, which was manifested in the emphasis on “German beauty and strength” in artistry or in the highlighting of “German daringness” and “German discipline” in the training of predatory animals. Nevertheless, the initial stand of the National Socialist regime in regards to the circus scene was a negative one. This can be seen in the series of orders that affected the circus world. As an example of this, from May 1933 onwards, employment of all foreigners was dependent upon having an official work permit. With the intensified enforcement of this regulation after 1934, the number of employees of all larger German circuses diminished significantly. Furthermore, on February 14 1935, a regulation was issued which obliged all German circus directors to prove their “Aryan origin”. As late as 1935, prohibitions were still being announced in regards to the wearing of “foreign [artfremde]” costumes, the presence of “black people” and “people with mixed background” in the circus arena or the “participation of Jews” in performances of “German culture”. Performances of people with physical disabilities were also forbidden. Nevertheless, people of short and tall statue were still allowed to perform within the circus scene. Presented as “dwarfs” and “giants”, they found their place within these areas, primarily as agents of German myths and fairy tales. Restrictive measures against travelling circus people in the 1930s were not, however, limited to National Socialist Germany. For instance, in France small travelling family circuses were a long established tradition and an integral part of the cultural life of the countryside. However, in the 1930s, the French government restricted the mobility of these so-called nomads and, even before the occupation of France by the German Wehrmacht, a decree of the French Ministry of the Interior ordered the internment of all nomadic groups. Nomadic families were also taken to the Rivesaltes camp some 40 km from the Spanish border. These camps were not only spaces with limited supply of goods; they were also spaces where the inmates suffered from poor hygienic conditions. 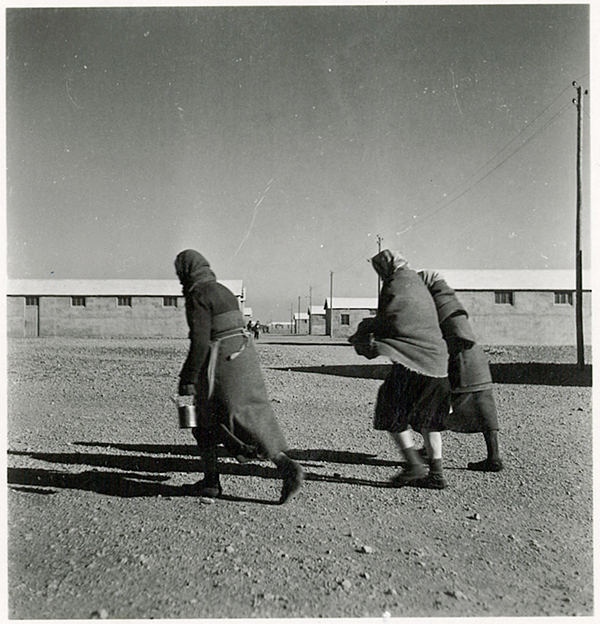 Paul Senn, Women on their road in camp Rivesaltes, France, print from the album by Friedel Reiter, Archive for Contemporary History, Zurich, © Foundation of Gottfried Keller, Bern. Sources: Gurême, Raymond; Ligner, Isabelle: Interdit aux nomades. Paris 2011; Lipphardt, Anna: Spielraum des Globalen: Deutschland und der Zirkus. In: Reichardt, Ulfried (ed. ): Die Vermessung der Globalisierung. Kulturwissenschaftliche Perspektiven. Heidelberg 2008. S. 168-171. Scheugl, Hans: Show Freaks & Monster. Die Sammlung Felix Adonos. Köln 1974.